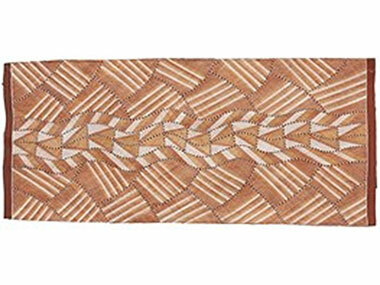 It's reported from Maningrida that the great Kuninjku bark artist, Samuel Namunjdja died in early May. He was only 54 and leaves a substantial family on his Mankorlod outstation, some 50km from the Western Arnhemland township. I had the pleasure of visiting him and his community of 30 and was warmly welcomed into this creative place – so close to the Country Namunjdja he cared for and painted. His documentation of its rock art was legendary, and his good-humoured approach to life, even as he took seriously the evolution of his art to a unique level of abstraction, made clear that he was not a tortured artist. Samuel Namunjdja was born in West Central Arnhem Land in August 1965. He was a member of an artistic family, being taught to paint the stories of his clan by his father, Peter Marralwanga, a distinguished painter in his own right and the legendary Yirawala's sister's son. That school of coiled spring figures of both animals and mythic creatures was in good hands. When only in his 20s, Namunjdja won what was then called the Rothmans Foundation Award for Best Painting in a Traditional Media at the National Aboriginal Art Awards in 1993. He followed up with a high commendation in 2003 and by winning the 2006 Telstra Bark Painting Award at the National Aboriginal and Torres Strait Islander Art Awards. In 1993, his subject was 'Namorrodoh' a malicious spirit of the Stone Country; by 2006, he'd moved on into the abstraction that his brother-in-law, Johnny Mawurndjul pioneered, tackling the esoteric subject of Gungura, the Wind Dreaming. Gungura has several meanings. It is the spiralling wind associated with several sites of the Kardbam clan – especially one called Bilwoninj - and can also be interpreted as representing the mini-cyclones which are common during Arnhemland's wet season. At Bilwoninj, two of the most important Kuninjku creation beings, a father and son know as Nakorrkko, have hunted and eaten a goanna. But they left some of the goanna fat behind which turned into the rock that still stands at this site. Bilwoninj is also the ceremonial ground for Yabbaduruwa, a major ceremony which is concerned with matters of initiation, land ownership and the cycles of regeneration of man and nature. Other favourite subjects were Mimi spirit figures, Ngalyod the rainbow serpent and the Namarrkon, lightning man. Namunjdja didn't only paint these traditional stories, but also looked to less sacred matters and everyday activities such as fishing for yabbies, or collecting various animals and plants. Namunjdja developed a particularly delicate style of rarrk and his detailed application of the ochre created a lyrical surface. There is movement, life and depth in the work. Namunjdja's first show was in Darwin as long ago as 1988 – and since then his work has travelled to Paris, Seattle, Ljubliana, London, Mito Japan and Washington. At the commercial level, he's had five solo shows at Niagara Gallery in Melbourne and one at Annandale Galleries in Sydney, plus more than 30 group shows. His first Wind Dreamings took the eye of National Gallery of Victoria curator, Jason Smith, who then included Namunjdja in the important cross-cultural exhibition, Living Together is Easy in 2004, a joint show with the Contemporary Art Centre, Japan. Living Together is Easy brought together the diverse practices of six Australian and six Japanese artists. The exhibition was (in the NGV's words) “an ambitious collaborative project and result of cultural exchange. Living Together is Easy seeks connections between regional specificity and cultural identity, global politics and interpersonal relationships, biodiversity and sustainable ecologies, and the natural and constructed environment”. The participating artists were Tetsuya Nakamura, Kaoru Motomiya, Tabaimo, Taro Shinoda, Tadasu Takamine and Akira Yamaguchi, Rosemary Laing, Fiona Hall, Susan Norrie, Samuel Namunjdja, Ricky Swallow and David Rosetzky. A sky-full of stars! His work can be found in numerous collections including the Kluge Collection in the USA, The Kelton Foundation in the USA, Musee des Confluences in France and locally at the National Gallery in Canberra, the Art Gallery of New South Wales, National Gallery of Victoria, and the Queensland Art Gallery. His work was also included in the seminal Crossing Country history show covering the breadth of the art in Western Arnhemland at the AGNSW. And that breadth stood Samuel Namunjdja in good stead when the mess that was the Intervention lead to the shut-down of Maningrida's art centre. 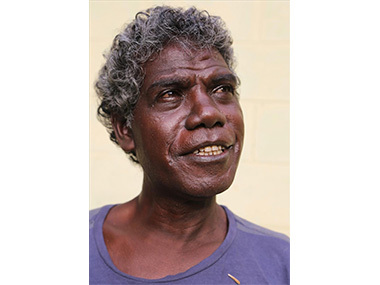 Through family connections such as his cousin Glen Namundja, Samuel was able to continue painting for the Injalak Art Centre in Oenpelli. 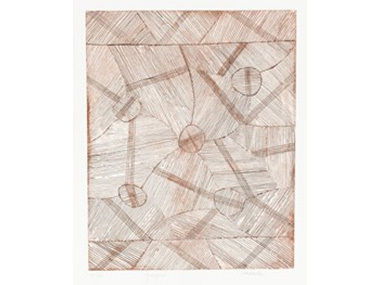 In his last Niagara show, Namunjdja showed off his talent for minimalist, intricate etching. Hopefully, the on-going sale of that work will assist his family. In 2007, the long-term art manager in Maningrida, Apolline Kohen organised a big show in London of 110 paintings, sculptures and lorrkons/painted log coffins. It was reported in the Financial Times and caused the irrepressible artist and Times columnist, Grayson Perry to assert that “Aboriginal art failed to pass the key gate-keeping tests of aesthetic and intellectual complexity”. Of course, he later relented when challenged in Australia. But, in preparations for the show, Kohen asked Namunjdja: “Are you ready for London?”. “What time we going?” was his keen response about a visit that was still a month away. It would seem that something of this same eagerness has taken him from his Country and family far too early. Oddly, the Maningrida Arts & Culture website doesn't yet report his passing. A recent etching of 'Gungura' the Wind Dreaming, which was a major ceremonial site near Namunjdja's outstation.